STM32 Value-line discovery board is a low-cost evaluation board for Value-line of STM32 microcontrollers from STMicroelectronics. Value line of STM32 microcontrollers are low cost version of higher devices. It's can run on 24MHz and dont have some of peripherals avaiable on higher devices. On this board is soldered 64-pin value-line STM32 (with ARM Cortex-M3 core) microcontroller and ST-Link debugger, so board is complede hardware needed to run programs for STM32 devices! You olny need USB cable for connection board to PC. Of course, we need build some external hardware because on the STM32LVDISCOVERY are mounted only two LEDs and two pushbuttons - one for RESET and one for user application purposes. 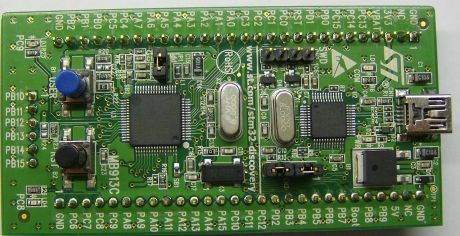 Discovery board has two long row of pinheaders and one short (between them) with all important signals from microcontroller and power supply voltages. Due to this short connector STM32VLDISCOVERY board can not be placed on typical solderless board. Base board for discovery board will be described in one of articles. This tutorial shows you how to write applications for STM32 devices without use STM32 StdPeriph Library. This library in my opinion isn't best solution for writing apps for STM32 and I show You that writing apps without this library is easy and fun. Although this tutorial is based on STM32 Value Line micros and STM32VLDISCOVERY board in most cases can be also used for other STM32F1 (mainstream) devices and other development boards.